Today we’d like to introduce you to Stephanie Sullivan. When I was a kid I spent summers with my grandparents, and my grandmother taught me to paint with watercolor. We’d sit outside on the patio and paint still life – everything from landscapes, to baskets of fruit. I clearly had an inclination toward the creative, at an early age. As I got older, this inclination shifted from a love of painting to a love of theater, and I’ve been acting on stage for the last 20 years. About four years ago, I decided to try one of those wine and paint nights; I’d never painted with acrylics before but had a great time and felt inspired to start painting again. It was all new to me, but I enjoyed playing with and trying different techniques; everything I do now is entirely self-taught. I dabbled with oils as well but ultimately gravitated toward acrylic paint because it dries much more quickly, which gives me faster turnaround time, and because I really enjoy the vibrant colors you get out of acrylics. 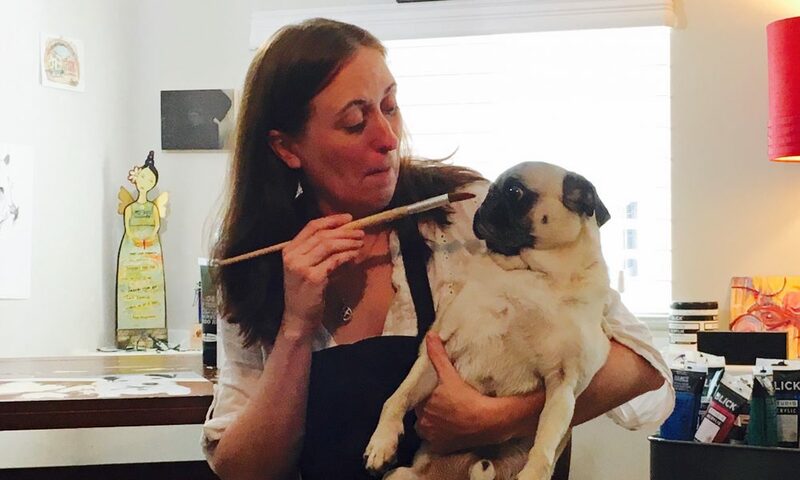 I grew up with dogs and cats, and always had a natural affinity toward animals; a way of connecting to them, and a sensitivity toward them that makes painting them such a joy. The idea of getting paid to do something I truly love is such a dream. I realized in starting this that I had an opportunity to not only put a smile on people’s faces, but also to give back to the animals that have given so much to me. When I paint a portrait of someone’s pet, I donate 10% of the proceeds to a shelter of the person’s choice. It’s a win-win-win all around! The road hasn’t always been smooth, no. For starters, I’m entirely self-taught: from the actual painting itself, to the creation of a business. From a business perspective, the biggest struggles I’ve found have had to do with the marketing and management side of things. As a one-woman show, it’s tricky to juggle maintaining a website, staying in touch with clients, advertising myself on a budget, and staying relevant on social media sites. The world of marketing feels overwhelming at times! Where do I post? Facebook? Instagram? Pinterest? And how can I get the word out without breaking the bank? I imagine that any entrepreneur experiences some of these struggles in the beginning. There’s a lot to learn in starting and growing a business! Please tell us about 4 Paws Portraits. I started this business based on my love for animals and based on a recognition that people love their pets because they are family; having a customized painting of your fur baby is very special! I start with one or more photographs of the person’s pet. I ask for one main photo wherein the pet’s face can be seen very clearly, and I use supplementary photos, if available, as a reference for coloring, texture, and personality. In addition, if a person wants to combine different elements from multiple photos (i.e. the pet’s pose in one photo, but the background from another, etc.) I am happy to combine photos in that way. What sets me apart from other artists is my process. I work very closely with the pet owner to customize the painting. You can choose to incorporate a solid colored background, or work with me to create a customized background. When it comes to custom backgrounds, I’ve had requests to incorporate everything from a pet’s favorite toy/blanket, to a person’s favorite location (beach, park, city, etc), to a person’s favorite sports team. The sky’s the limit! The ideas for custom backgrounds can be very specific, but can also be more symbolic in nature because I will come up with unique ways of fusing together whatever ideas you throw my way. And before I even begin painting a custom background, I provide a “mock up” of what the painting will look like, to be sure that my thoughts and ideas align with the pet owner’s. Throughout the process, I will provide progress photos so that the pet owner isn’t left completely in the dark and toward the end of my process I always ask for feedback and then work to make adjustments to the painting until the pet owner is completely satisfied. I pride myself on being able to guarantee satisfaction, 100% of the time because of the unique way in which I work with people, and because I truly care about having people walk away with something that feels special to them. Pet portraits also make really great gifts that are not only meaningful but also memorable. I can either paint the portrait, if a picture can be provided, OR you can buy a customized gift card with the recipient’s name. This is perfect for holiday gifts, birthday gifts, or pet commemoration after the loss of a pet. I’ve even had Real Estate agents gift a pet portrait to a client as a closing gift. And I always donate 10% of my proceeds to a shelter of the person’s choosing. As a side note, I also teach classes on how to paint your pet and people can book me for private parties. I have relationships with a couple of different bars that allow me to use their space, or I can come to people’s homes. It makes for a really fun evening and more information about this can be found on my site. The biggest lesson I learned is that when you put your mind to something, and really stick it with it throughout struggles and challenges, you really can achieve whatever you are determined to achieve. Amazing story and wonderful paintings! I like what Stephanie says about persistance and gumption in the closing.